Wow, it was hard to come by! Did you know Supernatural may be anime? Check out the character sketches here. I'll definitely watch! Today, I'm happy to host guest blogger Theresa Meyers. When I heard about her exciting new series and her love for Supernatural, I knew she'd be a great person to come by and share the love for our favorite show. You know how they say write what you love? But what if what you love is a whole bunch of different things? So what’s a writer to do? Write it anyway! I love writing paranormals for Harlequin’s Nocturne line and admit to being a total squee-girl fan of the television show Supernatural (in fact, Jensen Ackles aka Dean, if you are reading this, can we talk? I’d love for you to play one of the brothers in my books if they ever go to the big screen). I love history, and in particular I’m a bit of a Victorian nut, so I write historicals. I’ll admit to being partial to the American West simply because I’ve been a West Coast girl all my life, living in California, Oregon, Washington and Arizona, all for different periods of my life. Now normally you’d think there was no way to blend all of that together, but guess what—there is. Case in point is the new series I’m currently writing for Kensington that won’t come out until 2011 with the first book, The Hunter. It’s a Steampunk trilogy featuring three brothers named after their father’s favorite guns in the Weird Wild West who hunt down supernatural beings along with help from their slightly mad British inventor friend Marley to protect mankind. From skinwalkers and demons to vampires and shape-shifters, they hunt them all, as they work to find the missing pieces of The Book of Legend, the compendium of all Hunter knowledge. I originally had the idea for the brothers decades ago. I knew who they were, but I didn’t realize this whole other side of them until I was watching the outtake interviews on one of my seasons disks of Supernatural where one of the writers for the show was talking about how he’d always thought it would be cool if they could have gone back in the series to the Wild West. Seen what it was like for Hunters in history. That got me thinking. Who were the Hunters in history, where did they come from? How do they know what they know and train one another? I mean really, you know there’s got to be more to it than what you seen on the screen. Every good character has a history. That’s when it hit me. My Jackson brothers were Hunters. That was the thing that held these three very different men together. From there I created a whole history and world that stretches back to the dark ages where the Book of Legend was torn apart and scattered to protect it so that Hunters might learn portions of what they needed to know but would have to find one another to truly understand it all. Winchester, Remington and Colt all have different approaches to being part of their Hunter legacy. Colt (my hero in The Hunter) is a bit of a bad boy, gambler/gunslinger who really, really likes women. He’s the baby and has the whole “Go hard or go home” mentality to him. Which makes things really interesting when he needs the help of a demon to unlock the hiding place of the piece of the Book of Legend he’s searching for. Nothing like a succubus to keep a womanizing bad boy on his toes! Oldest brother Winchester has sworn off hunting and become a lawman in the Wild West. But that doesn’t mean the supernatural baddies out there have forgotten who he is or where he came from. As the Gates of Nyx threaten to open, letting the Darkin out into the world, he knows he’s going to have to help his brothers out, even if it means going back into hunting. He’s got to accept the help of a vampire countess to track down the second piece of the book. Middle brother Remington likes to straddle both sides of the law as an attorney. He’s my half-and-half brother, able to understand both his brothers' philosophies. Remington can just about talk his way out of (or into) anything. But when it all boils down to finding the last piece of the Book of Legend, a shape-shifter thief is going to take him into situations that’ll leave him speechless. Now, you’re probably scratching your head saying, hey wait, these just kind of sound like western-set paranormals. What’s that got to do with steampunk? My version of their world is just a little bit different than you’d read in your average western. For example, when the vampire countess comes calling, she has an airship to take them back to Europe on the journey to retrieve the segment of the book. Colt has a faithful mechanical horse, named Tempus, whose clockworks make him very reliable in the unrelenting travel in the western frontier. And remember that inventor friend I mentioned? He gives the boys all kinds of fun experimental weapons (and where, exactly did you think the demon-killing Colt gun came from in the first place?). The best way to understand steampunk is to know that the steam refers to the steam age, Victorian era. The story can be set anywhere in the world (or in a parallel world for that matter) during that time when combustion engines weren’t the norm and steam ruled as a power source. The Punk of steampunk comes when you adapt the world to fit your vision of it. Girls as airship captains, inventions that can bore into the earth, search the bottom of the seas, zap holes through a vampire at twenty paces, mad inventors, intrepid adventurers and explorers. You get the idea. So there you have it. A way to blend an unnatural obsession with Supernatural into historical, steampunk, paranormal romance. Sweet, huh? I can’t wait. I can't wait either! I think this series sounds amazing, and I'll be there at the bookstore when The Hunter hits the shelves. Thanks for being with us today, Theresa. So, everyone, have questions for Theresa? Do you think this series sounds as awesome as I do? Until the series' release, be sure to check out Theresa's other stories for Nocturne Bites. 1. Here we are at Stonehenge with a random tour group. The earth is shaking. Quaking, one might say. Does anyone move away from those towering stones that would crush you if they fell, as things are wont to do in an earthquake? No. b. Stand still and scream. I guess it doesn't matter, since we've already overlooked the fact that Stonehenge has been off limits to the general public for a very long time. 3. Why is Misha's character Jacob and his friend Joseph? Why not Jake and Joe? 4. That random hazmat person who just got fried? Kinda deserved it. Duh, you knew the thing burned up seven people. Maybe you should RUN. 5. Misha...I mean, Jacob...just emerged from the woods in the morning. Where was he all night, after being chased by security? Hanging in the woods? Yuck. 6. Um...if a signal is reducing itself every time it cycles, isn't it by definition counting down? 7. Jacob has a bit of the Dean vibe, with his layered shirts and the pendant. 8. How exactly did Jacob "pick up" an electromagnetic surge over a distance of x miles and an ocean, anyway? 9. Okay, the first death was inevitable. The second a justifiable mistake. But once something happens twice, you have no one to blame but yourself for letting it happen a third time. 10. Of COURSE the military thinks demolition is the right move! Do they never watch movies or TV? That never ends well. 11. They keep asking how these stones move, but they haven't tried to dig down a little bit to find the tracks they're obviously moving ON. 12. These people don't read comic books. That's Dr. X's symbol on that Mediterranean artifact that Jacob thinks is a key! 14. I can't wait to see how long it takes Jacob and the real scientist to get to New York and back! :) They've only got 30 hours. 15. Well, ridiculous science and plot developments aside, I think the idea of re-terraforming the planet is kind of cool. 16. Oh, what a coincidence, the artifact goes EM just as they arrive at the museum. Trigger? None. How convenient to prove Jacob right! 17. Plot twist! Who are those armed whatever they ares bent on getting the artifact for themselves? Uh...Joseph? 18. Commence exchange of catch phrases between former best friends who are now on extremely opposite sides...catch phrases that would indicate insanity if they weren't so overused. 19. Ow. ETA: I can't remember what happened that made me say that. 20. Stones are moving again. How can they be digging up new sod when they're following the same tracks? 21. I'm so glad Joseph's "Chosen Ones" laugh like Beavis and Butthead. Future of the human race, indeed. 22. Wow, the artifact/key thing got clean and shiny. 23. Hey, the bad guy died with half an hour left to go. Good thing he wasn't superfluous or anything. 25. I hope someone gave Misha/Jacob a GPS, so he doesn't take a wrong turn during his race against the clock/nuclear bomb. 26. Four minutes left, and poor Jacob gets shot feet from his goal! Oh, the tension! I can't tell where the second bullet hit. He's probably not dead. 27. Say it with me now: "It was a ROBOT HEAD." 28. That was the lamest ending EVER. 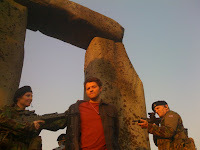 I just finished watching Stonehenge Apocalypse with the intent to review it for this blog, but…I just couldn’t do it. While it’s nowhere near as bad as Raptor Island or Ice Spiders, it was, well, it was not good. It did, however, give me an idea—craptacular movies I’ve watched in the name of love for the boys. Let’s start with Jeffrey Dean Morgan, who, let’s face it, is the reason I started watching the show in the first place. “Dead and Breakfast,” a zombie movie with hints of humor that Tanya would never forgive me for mentioning. JDM plays a sheriff who leads the young tourists in their fight against the zombie horde. Nothing redeeming in this movie. Nothing. “Six: The Mark Unleashed,” a religious movie set in a prison, otherwise completely forgettable. One of the Baldwins was in it. Oh, just terrible. “Taking Woodstock.” He was in it about a minute, and the other minutes I was bored. Bored bored bored. “Kabluey.” I actually bought the DVD and he’s in it about 10 minutes, as the lecherous boss of the main down-on-his-luck character’s sister. “Live.” There is NO WAY I would have watched this movie without JDM. It was a horrible concept, people playing Russian Roulette on live TV, with portraits of each contestant shown to sway your pity. Terrible terrible terrible. But he looked really good. Now Jensen has had slightly better taste in the roles he’s taken. Well, actually, he’s been in more good TV than bad movies. “Devour” was the worst. So bad I’ve actually blocked it out. All I remember is the last scene, which was very bloody. “My Bloody Valentine” was as good as Jensen could make it. Not particularly suspenseful, though, even if I hadn’t been spoiled. “House of Wax,” though he’s very heroic. “Friday the 13th,” but he looked REALLY good, and it was filmed in Texas. Totally worth my time. Twice. What movies have you watched out of love for the boys? Don't forget to watch Misha's movie on SyFy tonight! 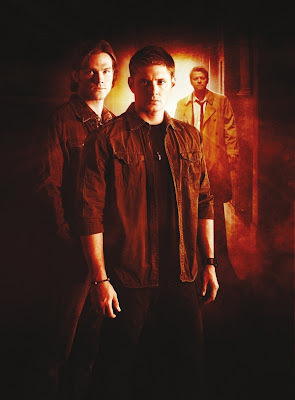 I started watching Supernatural in the second season, when it was still on Tuesday night. I think they switched it to Thursday for season 3, so that "feels" like the right night. Honestly, it doesn't matter. I'll watch it no matter when/where it is, with very little getting in the way, and if I can't watch live, I'll DVR it to watch later. But now they're moving our beloved show to Friday night, aka The Night Shows Go to Die. I know at least one person that is a problem for: she has a family night on Fridays, and is religious about it. Friday is "party" night, too, so ratings overall tend to be pretty low. Most shows that get moved to Friday don't last very long. On the other hand, dying or being killed isn't a given, generally speaking. There have always been shows that did well on Friday, such as Providencetown and Numb3rs. Smallville kept its numbers the same after being moved to Friday, and it was always a good pairing with Supernatural (though I'd argue that The Vampire Diaries makes a better combo). We hear a lot among "fandom" about how the CW doesn't give our show any love—doesn't promote it, doesn't support it, etc.—but after three years in a row of early pickups, and insisting it continue after a natural end point, I'd have to call bs on that complaint. Supernatural is a solid performer for them, and they struggle to develop new shows/enough programming for a full week. So in my opinion, the move to Friday isn't necessarily a bad omen. In fact, I think we have to be more concerned about Ackles and Padalecki's contracts expiring this year. We see it in every season of Supernatural, even moreso in that powerful finale a few weeks ago, but the heart of the show we all know and love is brotherhood. Sure, I like the humor (when it's there) and the classic rock underscoring the stories (when such songs are in the budget) and obviously, Jensen and Jared are extremely easy on the eyes. But there are lots of shows starring pretty people that I don't watch, much less DVR and obsess over. Not every episode is deeply complex (although many are) and not every episode is horrifically gory (thank God) but each one since the pilot has something to say about the bond between brothers, whether it's love so deep that one would literally sacrifice himself for the other, rivalry and resentment so deep it borders on the knife's edge of hate, or a much lighter middle ground such as the pranks family members pull on each other. 1. Firefly a--even though it's a futuristic western set in space, watching a brother sacrifice in order to care for his younger sister is relatable and poignant. X-Men (2000) I always felt like Magento and Xavier were brothers who landed on different sides of the same war. Revenge of the Sith - Although it makes sense to watch these Star Wars prequels in order if you want to see the full scope of Anakin's transformation into Lord Vader, I feel that this one (#3 in the first trilogy) is the strongest and marks the shift in Anakin and Obi-Wan's relationship, from mentor/student to Jedi brothers who share both love and rivalry. So there's my brief list to kick things off. What movies/shows/books featuring siblings would you recommend for a long, Winchesterless summer? News is super scarce while we're on hellatus. :( This was all I could find. Casting/Dialogue Director Andrea Romano highly compliments Jensen's voiceover work for Batman: Under the Red Hood. I read half of this book in two days, which is unheard of for me these days. I like this one better than Heart of the Dragon, for one because the boys are featured almost from page one. The setting is a Civil War reenactment, where a reenactor becomes possessed and kills some of his comrades. 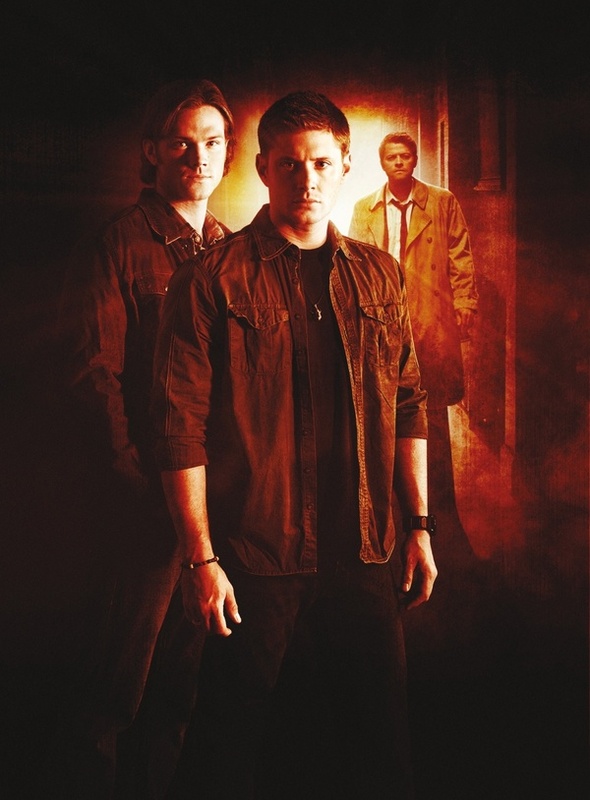 After a confusing red herring (the person killed has the same name as a missing boy the Winchesters go to investigate), the action picks up. The pacing is just like a show. It's a little complicated to explain the story, but I'll do my best with my end-of-the-school-year brain. So the first guy is possessed, but then he kills himself. When the boys investigate, they see a rope burn on his neck, though there was no rope at the scene. Cass shows up and says the boys need to leave, that someone wants them there, and he thinks it's a First Witness, someone who broke bread with Christ himself. Well, with the rope, you can guess who. And the original possessed man isn't the last to be affected, so the brothers have to go on a search for the Judas Rope (recognizable by the way it's knotted). In addition, they have to deal with cursed pieces of silver, a sheriff with secrets, a creepy possessed black substance and demons who also want the rope. LOTS of action. While there are undercurrents of the apocalypse arc, this reads like a standalone episode. I really liked Joe Schreiber's writing style, I enjoyed the setting and thought he captured the voices of the characters well. This is my favorite of the novels so far. Having just watched the series finale of LOST recently, it got me to wondering how Supernatural will end when the show takes its final bow. The part of me that loves stories with happy endings wants that for the boys, but that's never really been part of the show. I wonder if it would totally feel out of place if we got a happy ending finale. Still, they've literally been to hell and back, so it would feel right if they got some wonderful reward. Maybe their memories of all the bad could be wiped and the task of protecting mankind handed off to someone else. Hmm, not sure how I feel about that. Another option is them going out in a blaze of glory. I think I need to buy stock in Kleenex if it feels like the writers are taking us toward this eventuality. Still, it would be in keeping with the Winchesters' personalities and histories, wouldn't it? A third possibility is a LOST-esque, open-to-interpretation ending. Maybe we don't see what happens or if we do, we're not sure what it means and speculation will rage for years as it no doubt will among LOST fans. While some LOST fans loved this type of ending because it fit with how LOST had been crafted from the beginning, I don't think it would work for Supernatural. What do you all think? Think we'll go one of these routes, or some other way entirely?